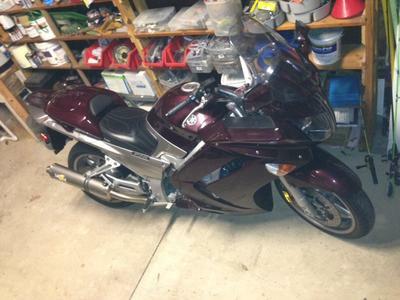 The 2007 Yamaha FJR1300 for sale has had the Yamaha manufacturer exhaust upgraded Vance Hines Exhaust. I had the stock pipes replaced when I ordered the bike brand new. The FJR 1300 has a single Corbin motorcycle seat with second seat storage. PLUS, I have the original dual seat as well. I have kept this motorcycle inside the garage from day one and it curreently has 5300 miles on it. The FJR really looks just like it did when it was brand new. If you have any questions regarding the 07 FJR for sale or if you would like to make an appointment to see it in person or make payment and pick up you can do so using the space below that has been provided by GoGoCycles Used Motorcycles for Sale and PLEASE do not neglect to include your contact information in your email or to provide a phone number or email address so that I can respond with answers to your questions or set up an appointment as quickly as possible. In my opinion, there is not a better deal around on a used Yamaha for sale as this FJR anywhere around St. Augustine Florida FL, on Craigslist or in an Ebay auction so hurry and make an offer before this beauty gets away from you! GoGoCycles would also encourage our biker friends to write a review of the 2007 Yamaha FJR1300 or share any thoughts and/or opinions to make potential buyers aware of any problems that are commonly associated with this bike or to highlight its positive features and help our visitors make informed decisions. My asking price for this "just like new" bike is only $8000 so email before it's gone and don't forget to mention that you found this ad on GoGoCycles Motorcycle Classifieds www.gogocycles.com using the comments forms located on this page. This Black Cherry FJR sounds very nice. Is it still for sale?